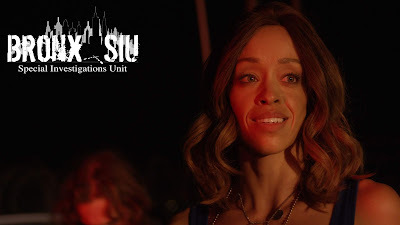 Shanti Lowry, a scene-stealer on TV’s The Game, is one of the stars of the new UMC police procedural series Bronx SIU, which premiered last week. Brian White (Chicago Fire, Ray Donovan, The Shield), Miguel A.Nunez Jr (Tour of Duty), Denise Boutte (Why Did I Get Married? ), Ameer Baraka (American Horror Story), Eddie Davenport (Westworld), Leticia Jimenez (Assassination Nation) and Keeland Ellis (Lucky Girl) help make up the support cast of the hottest new action-thriller series of the summer. Bronx SIU is written and produced by Mike Mayhall and Dan Garcia and directed by Mayhall. TMS: Very solid show! When did you shoot it? SL: Thank you so much! We shot in the fall of 2017. We shot in locations all around New York City. TMS: And did they require you to relocate? SL: I relocated to Brooklyn for about a month for filming. TMS: And did Brooklyn support the show? SL: Because we shot so much on the streets of the city, the community is very much a part of the show. And they couldn’t have been more gracious. TMS: And what’s the plan for the roll-out? SL: Episodes will begin premiering one week at a time on July 19th. Our first season is 8 episodes long. TMS: Who do you play? SL: I play Yolanda Rodriguez. A detective recently promoted to the SIU (Special investigations unit) in the Bronx division. A woman with grit, brains, courage, a dark past and a lot of secrets. Ive never played a character anything like her. Which is the best part! It was actually a real challenge and a real pleasure to bring Yolanda to life. She goes on such a layered, complex and deeply moving journey. I had a wonderful time researching many different aspects of her life - for about 3 weeks prior to shooting. TMS: Any training required for the part? SL: We definitely got a crash course in police lingo and procedure lol. Miranda rights? I can say em backwards in my sleep LOL. Bronx SIU airs on UMC and is available on Amazon Prime.